Need a break from city life? Greater Palm Springs offers scenic escapes by the hour or by the day. Find sanctuary among red-walled canyons, in a pine-scented forest, along a river bank, and more. These are only a few of the many places perfect for that individual, couple, or family getaway. The magical quality of Indian Canyons makes them a must for visitors and locals. Hiking and equestrian trails meander near or zigzag across snow-fed creeks (best time for water is spring) that deposit pale, smooth boulders at your feet. Above, jagged rocks tower with majestic presence. Three distinct canyons — Palm, Murray, and Andreas — make up this much-loved attraction owned and operated by the Agua Caliente Band of Cahuilla Indians. 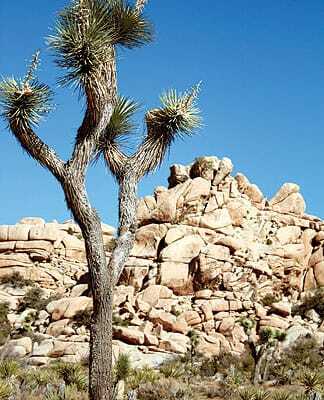 Contemplate the vast beauty of Joshua Tree National Park, approximately 45 miles north of Palm Springs. Two deserts merge among a seemingly endless swath of boulders. The Colorado Desert occupies the eastern half of the park and the higher, slightly cooler Mojave Desert makes up the western half of the park, where you’ll find statuesque Joshua trees. Year-round activities include hiking, biking, rock climbing, camping, and stargazing. Lake Cahuilla Recreation Area offers an ideal alternative getaway for folks who like to know that civilization and convenience stores are nearby. 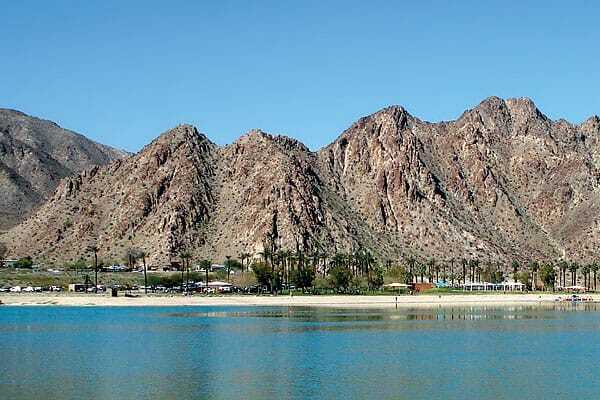 Spreading out from the base of the Santa Rosa Mountains, Lake Cahuilla features 710 acres with 91 individual and group campsites — and it’s only six miles from Old Town La Quinta. Activities include fishing (watercraft are not permitted in the 135-acre lake), hiking and horseback trails, and a swimming pool. Open grass areas feature picnic tables and barbecues. Showers are available and pets allowed. 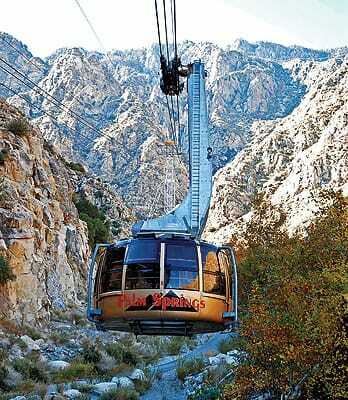 Take a turn on the Palm Springs Aerial Tramway for an elevated adventure like no other in the desert. Tram cars slowly rotate as you ascend jagged Chino Canyon, taking you from palms to pines in a matter of minutes. Once on top, enjoy 54 miles of hiking trails, including a 5.5-mile trek to the 10,834-foot peak of Mt. San Jacinto. In the winter, exchange bikinis for parkas and enjoy the experience of snow at the top. The tramway is closed for annual maintenance Sept. 10-23. A river runs through it — the Wildlands Conservancy’s Whitewater Preserve, that is. Enjoy the preserve’s more than 2,800 acres and the yearround flow of Whitewater River. Surrounded by the San Gorgonio Wilderness area, Whitewater Preserve serves as a vital wildlife corridor between the San Bernardino and San Jacinto mountains and is home to several species of endangered birds and a robust population of deer, bears, and bighorn sheep. Idyllic weather and diverse topography make the Coachella Valley perfect for hikers of all ages and levels. Here are a few favorite trails, ranging from easy to strenuous, that will satisfy your wanderlust. Visit www.palmspringslife.com for more hiking information. Trailhead: Check in at Tahquitz Visitor Center, located at the end of Mesquite Avenue. Description: A guided nature hike of lower Tahquitz Canyon, on the Agua Caliente Reservation, leads to a 60-foot waterfall. Admission charge. Trailhead: Begins behind the parking lot of Palm Springs Art Museum at 101 Museum Drive. Description: Hike to the popular picnic area on a ridge overlooking the city. The steep trail intercepts the longer North Lykken Trail and affords views of the entire valley. Trailhead: Access trail from top of La Quinta Cove. Description: Barrel cactus, ocotillos, and compelling vistas delight serious hikers. Boo Hoff Trail ends at Lake Cahuilla (shuttle) or loop back to La Quinta Cove via the La Quinta Cove-Lake Cahuilla Trail. Take in the stunning beauty of the area on horseback. Smoke Tree Stables in Palm Springs offers guided tours on a horse that’s selected specifically for your riding level. Let someone else hold the reins for a while. Big Horse Carriage Company offers daily carriage rides through and around downtown Palm Springs, weather permitting. From eco-desert adventures to the San Andreas Fault and Joshua Tree National Park to theme parties and team building, Desert Adventures has a tour or program for almost every desire. Nearly perfect weather; easy streets; and tons of places to go, see, and do make Palm Springs ideal for a scooter adventure. Scoot Palm Springs, located at the Ace Hotel & Swim Club, rents 50cc and 150cc scooters to qualified riders.